The content of this article provides interesting history, facts and information about Gladiators Clothing. Gladiators in general wore minimal amounts of clothing and almost all of the different types of gladiators fought with bare chests, which the Romans viewed as a symbol of masculine virility. For the sake of modesty they wore a canvas loin cloth, called a subligaculum, which was worn in a variety of colors. Gladiators clothing was finished with sandals although many fought barefoot. 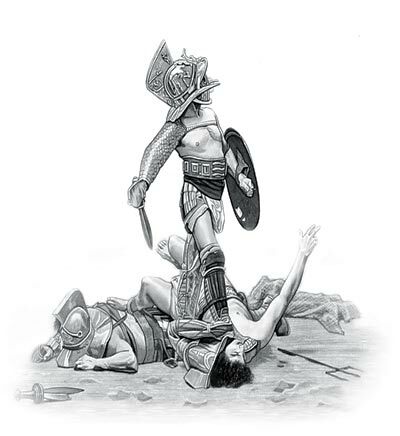 Apart from the garments mentioned above the main elements of Gladiators Clothing consisted of protective clothing with provided forms of armor against the attack of their opponents. The focus of gladiators clothing always focuses on the clothes worn in the arena. Similar types of clothes would have been worn during the strenuous training the gladiators worked to but they also had quieter periods when basic, cheap woollen tunics (tunica) were worn. There were occasions when Gladiators Clothing was more stylish and expensive. It must be remembered that gladiators were paid each time they fought and they were allowed to keep any rewards and purses of money. The most successful gladiators were also treated like modern day 'Pop Idols' with fan worship, fame and glory. Successful gladiators could therefore buy better clothes than was supplied by the Gladiator schools. The type of clothing and the materials used to produce the clothing was however limited by the Roman Sumptuary Laws. The Roman Sumptuary Laws ensured that the clothes that were worn provided information about the status of the person wearing them. This was not just dictated by the wealth of the person, it also reflected their social standing. For instance, only Roman citizens were allowed to wear the Toga. The emperor was the only person allowed to wear a purple toga. So gladiators who were slaves could buy clothes but they were limited to garments such as tunics and cloaks. The expensive clothing of gladiators would be worn at public banquets. The evening before gladiators fought in the arena they ate at a public banquet called a 'cena libera'. Other Romans were permitted to observe the banquet and the gladiators encouraging hero worship, betting and as a general form of advertising for the forthcoming events at the arena. The content of this Gladiators Clothing category on Roman clothes worn by the people of Ancient Rome provides free educational details, facts and information for reference and research for schools, colleges and homework. Refer to the Colosseum Sitemap for a comprehensive search on interesting different categories containing the history, facts and information about life and clothes worn in Ancient Rome.